These truck model feeders may be mounted in the back of a pickup, or they can be mounted across a flatbed. All of these feeders work the same way. The trailer is powered by the small wheel being engaged against the ground wheel. 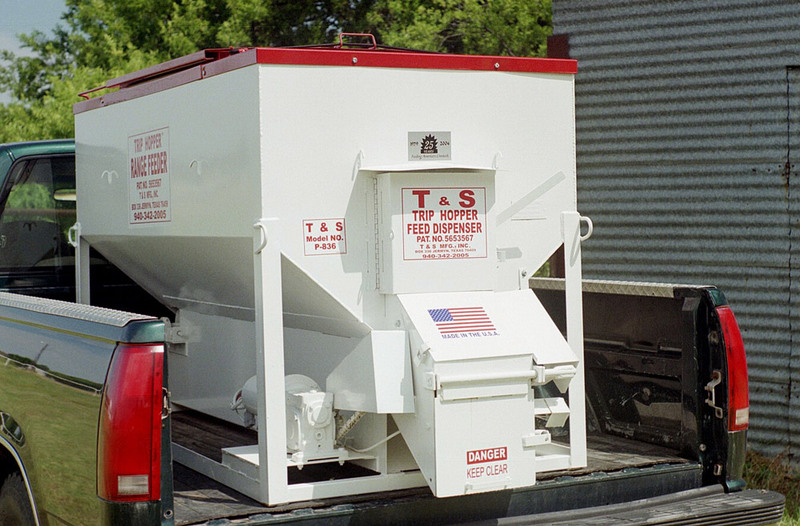 The truck model feeder is powered by a 12 volt motor that runs off the truck battery. These are not starter motors. These 12 volt motors are Constant Duty and are C-Face bolted to an oil bath gear reducer. They run for power and not speed. All wiring, switch and the complete counter assembly come with each feeder. Contact Southwest Fabricators for further details on these or any other model of feed bins.